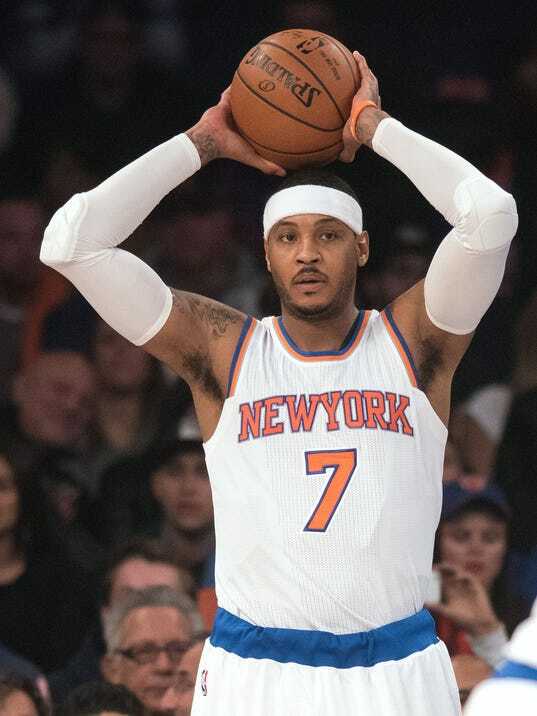 NEW YORK (AP) — Carmelo Anthony scored 28 points, Kristaps Porzingis had 19 and the New York Knicks beat the Brooklyn Nets 108-91 on Friday night to get back to .500. Arron Afflalo added 18 points for the Knicks (10-10), who dominated lowly Philadelphia and Brooklyn in their last two games after a four-game losing streak. They reclaimed city bragging rights with ease, leading by as much as 31 points. Brook Lopez scored 21 points, and Thaddeus Young had 18 points and 11 rebounds for the Nets. They had won two in a row and have a lot to fix before they host the unbeaten Golden State Warriors on Sunday. Lopez beat twin brother Robin to take the opening tip, and it was soon clear that was all the Nets would be winning. The Knicks blitzed them with a season-best 42 points in the first quarter, led 65-42 at halftime and opened their first lead of 30 or more since the 2013-14 season in the third period.